In this file photo, police are in the neighborhood where seven teenagers fled after the robbery of the AT&T Store on Old Troy Pike in February, 2018. The defendants were handed 9-year prison sentences for their roles in this crime. DAYTON — Three teens were sentenced to prison last week in connection with a robbery at the AT&T Phone Store on Old Troy Pike. The robbery, which occurred in February 2018, saw seven defendants hold customers and store employees on the ground at gunpoint. Police from multiple jurisdictions, including Beavercreek, Huber Heights, Riverside, Dayton, the Montgomery County Sheriff’s Office, Vandalia, and Butler Township responded and eventually arrested all the defendants who had fled the scene. While fleeing, the suspects struck a vehicle and then struck a parked vehicle before running from the vehicle. 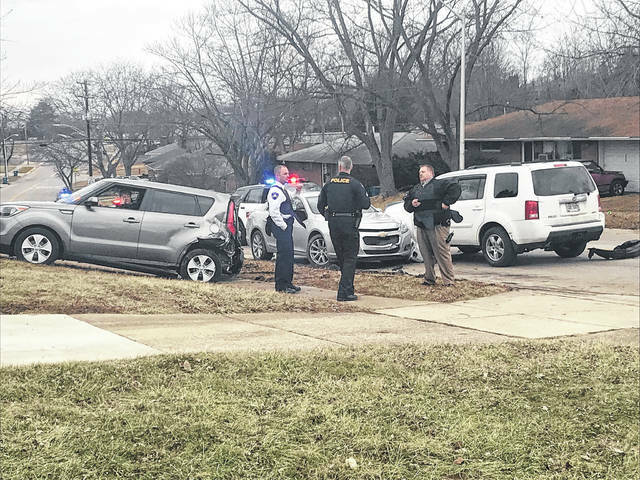 The ensuing chase forced a lockdown at the Huber Heights City Schools. Fortunately for police, the department’s SWAT team was training nearby and, along with officers from Dayton and the Montgomery County Sheriff’s Office, a perimeter was able to be formed quickly. Six of the defendants were juveniles at the time of the robbery but 5 of those case were transferred to adult court. On Friday, January 18, three of teens were sentenced. Taevon Felton, 18, convicted on two counts of Aggravated Robbery with a deadly weapon, and one count each of Kidnapping, and Improper Handling of a Firearm in a Motor Vehicle, was sentenced to a total of 9 years in prison. Defendant Danell Robinson, 16, convicted on two counts Aggravated Robbery with a deadly weapon and one count of Kidnapping, was sentenced to a total of 9 years in prison. Two other defendants, Caleb Johnson, 19, and Damion Raglin, 18, have also been found guilty and will be sentenced within the next few weeks.